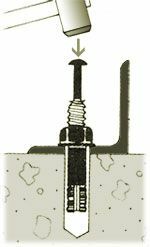 Installing concrete strike anchors can be completed in six easy steps. Strike anchors are designed to be used in solid concrete base material and are best suited for medium to heavy duty fastening purposes. They are made from carbon steel and are plated with yellow dichromate. 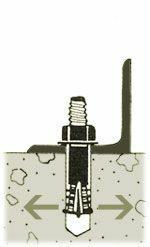 Strike anchors can be visually inspected after installation, which makes necessary inspection quick and easy. The nuts and bolts needed for installation are included, and can be pre-set for the desired embedment. 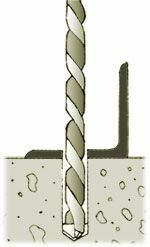 Drill a hole using a hammer drill and properly sized carbide tipped bit - remember - hole size is equal to anchor size. Be sure to drill a hole of sufficient depth. Put the nut and washer on the strike anchor. The nut may be flush with the top of the anchor or threaded on fully. Insert the strike anchor through the fixture and into the hole with the nut/washer and set-pin in place. Using a hammer, set the pin with several sharp and square strikes on the head of the pin until the pin is flush with the top of the strike anchor. The anchor is set with no need to torque the nut.